aFe F3 Torque Converter - Dezod Motorsports Inc - Home of the automotive performance enthusiast since 2002.
aFe Power is proud to announce the release of the new F3 Torque Converter line for diesel trucks. If you are looking to put your power to the pavement, you need our F3 Torque Converter. Torque converters are responsible for transferring engine power to the transmission. 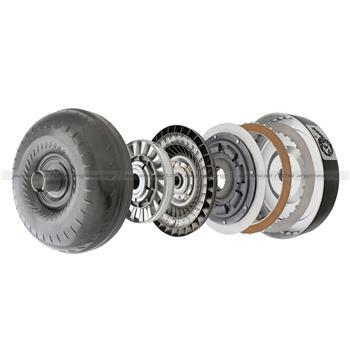 Single clutch OE torque converters can slip and increase transmission fluid temps. As you add engine performance parts like intakes, manifolds, etc. the factory torque converter’s stall RPM rises thus reducing the available low RPM pulling power. This is where the F3 torque converter comes in. Installing the F3 torque converter will lower your stall speed to as low as 1,200RPM giving you the perfect range for diesel trucks up to 1,000hp. The results of using an F3 torque converter are improved 0-60mph times (by up to 1-second), increases in towing speeds, lower transmission fluid temperatures and a more satisfying driving experience. The F3 torque converters come with a limited lifetime warranty.